I’m going to make my next batch of Sweet & Spicy Tacos with our new shredded beef. I use our sweet corn, chopped onions, green chiles, Chef’s Choice, salt and cumin in the recipe. I have to make them at least once a week. They’re that delicious. They create cravings. Thrive Life teased us for a week, telling us we had a new product coming out today for Qs and consultants. The only clues were that it was going to make dinner time even easier and that tasters said it was the best Thrive Life protein we make. Perfectly shredded, tender, and ready for dinner in just five minutes! Many are saying it’s our best tasting, easiest-to-use meat yet! Mix into soup, fold into tacos or bake into a casserole. Available to Consultants and Q Club members today! Available for all other customers July 10th. Don’t wait until the 10th! Start your Q today! 5% of all sales profits go to our Thriving Nations projects! Join us for an immersive African experience during this year’s service project in Davis, Utah! Start by drumming your heart out at our very first African drum circle, then get your craft on in the service project room making educational tools for our newly built school in Muungano! Finish off the day by bidding on art work made by the children in Muungano, and don’t forget to donate some school supplies! All donations and proceeds from the auction will go back to the village. Thrive Life impresses me every day! Join the Thrive Tribe and start your own Thrive Life business. I’m getting paid to eat. Are you? Read the Details here. This month you get extra perks! Check out our career plan to see how big your opportunity is with Thrive Life. Our monthly team call is on Saturday at 2:00 p.m. PST. Join us if you have questions. E-mail me for the call in number. Or maybe you just want to earn some free food this month by having a party. We have special host prizes now through July 21st! You can host a party from anywhere in the U.S. I will send all that you need to have a successful, fun party. You automatically get a party link on my website where your guests can learn about our food, and where you receive credit if they place an order. You can choose from an online video party, a Facebook party or an Instagram party as well. Look at what’s on sale! Shredded mozzarella, bananas, butternut squash, pineapple, apricots, strawberries, potatoes, diced beef, chopped chicken and asparagus. Get all 10 for only $135.79 plus shipping. The more Thrive Life food I eat, the better I feel. How good will you feel? 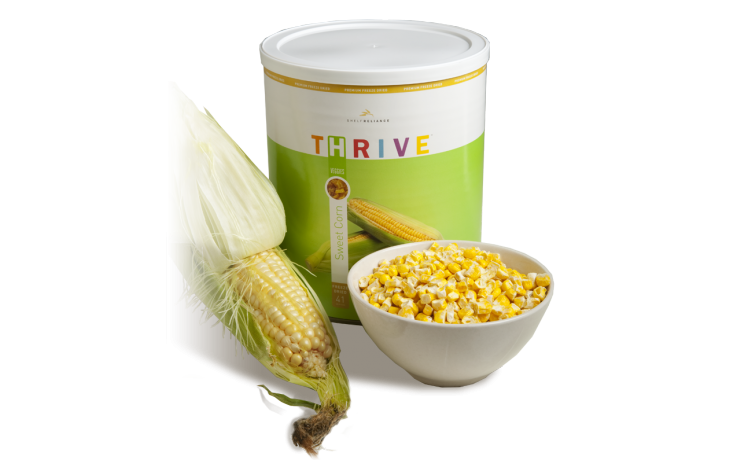 Months ago our good friend Diane Novack started posting about THRIVE Life foods. Gina’s curiosity grew when her posts kept coming. Gina was busy ending her position at the store and starting to teach regular classes on the weekend when she had the brilliant idea to offer food through our new company, The Reiki Cafe. Our search began for non-perishable foods we could offer to nutrition and Reiki clients. And there were Diane’s posts about how delicious THRIVE Life is. How convenient THRIVE Life is. How healthy THRIVE Life is. We asked questions about GMOs, pesticides, processing, hormones, food coloring, enzymes, and additives; Diane had all the right answers. All of that sounded great, but how did it taste? And was it expensive? Diane offered to come over to Gina’s for a tasting. Cyhndi’s mom was already a customer, and Cyhndi said everything she tried was great. Gina and Cyhndi agreed that if the food tasted good, it would have a home at The Reiki Cafe. The Corn is incredible. It satisfies cravings between lunch and dinner, and Gina is still pinching herself (not hard, don’t worry), because she found another way to add vegetables to her day. You can eat it out of the can, or reconstitute it. One ingredient on the label: corn. When you come for a meditation, session, or class at The Reiki Cafe, you will probably be offered pineapple-infused water. It is incredibly refreshing and delicious. Plus, there are active digestive enzymes in the water. Yum! Gina’s other favorite snack is Strawberry Yogurt Bites. $16.09 for 15 servings. Where was this food when the kids were going to school? It travels well, it tastes great, and it keeps them from eating the junk. 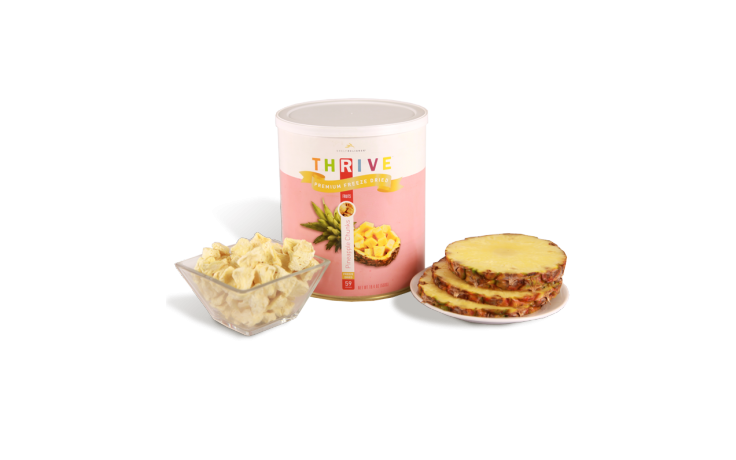 Gina is a THRIVE Life consultant, so please feel free to ask about ordering, hosting parties for free THRIVE Life foods from anywhere in the U.S. and Canada, and about starting your own THRIVE Life business. So, what do you think of THRIVE? Did you know we have a newsletter filled with bonuses, including THRIVE Life samples? Sign up for it here.